Optimization is not a creative process, but don’t tell that to folks in the marketing industry. Marketers seem to be blind to what optimization really means. Optimization is a mathematical process that requires using at least addition, subtraction, division, or multiplication in some basic form. Advanced optimization techniques will include algebra and calculus, or algorithms such as Naive Bayes or Monte Carlo. Optimization requires knowing your numbers and trying to achieve a maximum or minimal value to have the “optimized” result. Yes, you can think creatively or change creatives to alter user experience to get a desired result, but without the math, you are just doing a creative process. When I hear we “optimized our clients website” or we “optimized our clients search engine rankings,” I find the majority of the time no real optimization occurred as zero math was used. Marketing seems to be more of the blind leading the blind by providing guessing as a service instead of testing. Split testing should always be a part of marketing services to determine what causes positive or negative ROI outcomes in your sales funnel. There should be some math and some clear before and after change. An expert at marketing will use a statistical model or some sort of testing before actually performing the optimization. Why? Because they should never guess at the outcome. A professional marketer should be able to forecast or even predict the result prior to doing the work. If I make a change to X by altering these variables Y, Z = will I achieve the desired business goal? The snapshot below shows a clear before and after result. Optimization requires numbers to back up the cause and effect of the optimization. 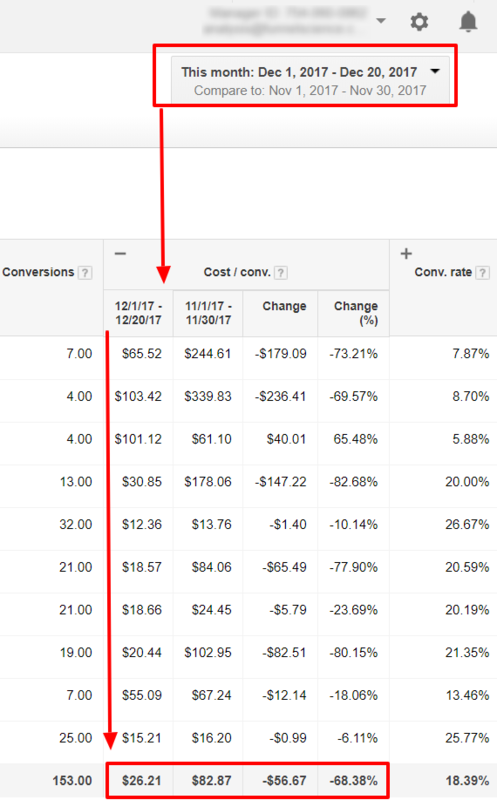 If we are optimizing the Cost-Per-Conversion, as we did in this client’s AdWords Campaigns, then you need to clearly be able to demonstrate how altering the campaign settings will lead to a reduced Cost-Per-Conversion. If you want to know how we reduced the AdWords Cost-Per-Conversion by 63% for this doctors office shown above, call to speak with one of our Google AdWords Experts.